Preheat oven to 425°F (375°F if using a dark, non-stick tin). Place baking cups in a 12-cup muffin tin and lightly grease the insides. Set aside. To me, doughnuts are a real treat. I love biting into that cake-like dough topped with a sugary glaze. But muffins are equally as tasty, and sometimes hit the spot even better than a doughnut. From blueberry to apple to chocolate chip, a muffin can make any day brighter. But a doughnut muffin? That is the best of both worlds. 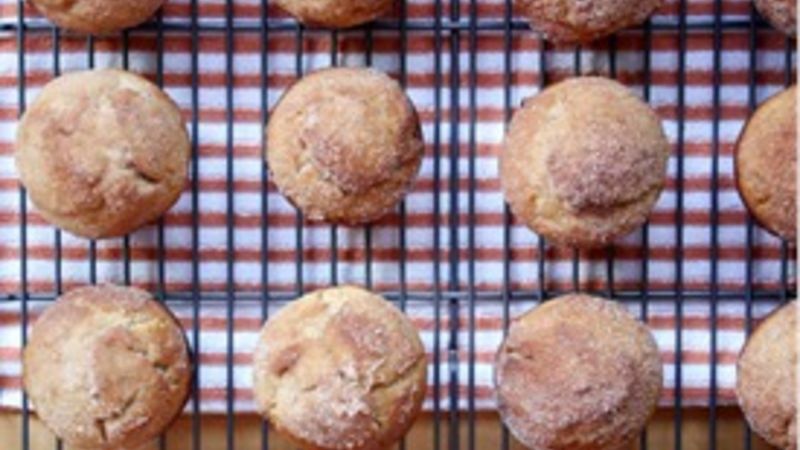 These Cider Doughnut Muffins are great to make for a quick breakfast or yummy snack during these crisp, cool fall months. They combine the texture of a doughnut with the ease of making muffins (no doughnut pans or hot oil baths for frying needed). Plus, the flavors of apple, cinnamon and sugar really shine through with the additions of cider or apple juice concentrate and a buttery, cinnamon-sugar topping. These doughnut muffins make great on-the-go school day breakfasts or after-school treats. They’re also perfect for Sunday brunches, potlucks or other get-togethers. Of course, you can make a whole batch just because and enjoy them yourself, too – let’s be honest, “just because” is reason enough to bake something this delicious. I personally prefer to make this recipe as simple as possible, so the doughnut texture can stand out, but for fans of extra crunch and flavor, feel free to add a little chopped apple or nuts to the mix. You also can swap out the cinnamon-sugar topping for your favorite streusel topping or doughnut glaze. When you’re making something called a doughnut muffin, you really can’t go wrong.